Solar energy is the cleanest and most abundant renewable energy source available. Recognizing the need for qualified photovoltaic installers, ETA® International will host a hands-on solar panel training and certification workshop in May. 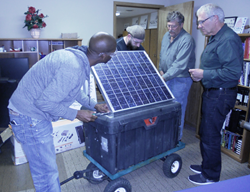 Jay Warmke, PV-1, Blue Rock Station, watches as Jessee Kreider of Ohio and Edward Kirkpatrick and Marwin Dean, both of Greencastle, complete the assembly of a solar panel during a 2014 workshop. A recent report by National Geographic states solar energy use has surged at about 20 percent a year over the past 15 years, thanks to rapidly falling prices and gains in efficiency. Solar energy consistently climbs in its level of contribution to the global energy demand. Anticipating the desire to learn renewable energy technology, ETA® International will host a solar panel, or photovoltaic (PV), certification workshop May 9-13 in Greencastle, IN with trainer Jay Warmke, PVI, of Blue Rock Station, Ohio. According to the Solar Foundation, there are currently over 210,000 people employed in the U.S. solar PV industry. One out of every 78 new jobs created since 2013 was in the solar field. This is especially remarkable, as solar only contributes about one percent of the energy currently used nationwide. Solar employs more than twice as many people as coal (93,000), which produces 37 percent of the nation's electricity. Solar continues to add jobs to the economy at a 20 percent and more rate per year, while the coal industry has seen a loss of over 50,000 jobs during a recent five-year period (from 2008-2012), according to a study from Duke University. Imagine the jobs that will be created when solar accounts for five percent, 10 or even 25 percent of the nation's electrical production. These PV jobs are good paying jobs too. The average U.S. solar installer earns between $20.00 (median) and $23.63 (mean) per hour, which is comparable to wages paid to skilled electricians and plumbers, but higher than average rates for roofers and construction workers. The five-day photovoltaic certification workshop will prepare attendees to harness the energy of the sun and install solar panels. Individuals will gain real world hands-on experience that will prepare them to take ETA’s Photovoltaic Installer (PV1) Level 1 certification exam and work in the solar energy field. Attendees will also build a small Photovoltaic system and install the solar panels at the ETA headquarters May 14-15. The course from Blue Rock Station is designed for beginners through electronics technicians and previous experience with electronics/electricity is not necessary. The class will receive hands-on experience with a working PV system to conceptualize a design, compare costs of various products, dismantle, trouble shoot and reinstall to ensure proper operation, along with an emphasis on rooftop safety. The course will consist of lectures (about 60%) as well as hands-on labs (about 40%). Attendees will work with a functional PV system, dismantling and reinstalling it, troubleshooting and ensuring its proper operation. During the course, attendees will learn to size the system according to electrical needs, select the type of system that works best for the situation, select all the components for the system, size the wiring and overcurrent protection, price the system along with size and select the battery bank (if needed). Upon completion of the workshop, attendees will be able to design from start to finish a residential solar PV system and install it as well. This course is also perfectly suited to professionals, who can take the class and then use it for Continuing Education Units for engineering and/or architectural license requirements. It is Warmke’s intent to get the class pre-approved from the USGBC as part of a LEED certification process. This one-week workshop qualifies for 35 hours of continuing education. “ETA intends to lead the industry in providing necessary certifications to insure that there are competent installers certified and available to work on photovoltaic systems and in other high-tech professions,” said ETA President Teresa Maher, CSS. The following are included in the $970 registration fee for the class: textbook: ‘Understanding Photovoltaics: A Study Guide for Solar Electric Certification Programs’; starter tool kit; lunches; and the ETA Photovoltaic Installer certification exam. All the details on the class can be found at http://www.bluerockstation.com/workshops/5-day-pv-certification-solar-electric-workshops. Contact Blue Rock Station at (740) 674-4300 or http://www.bluerockstation.com to register for the workshop and to learn more about renewable energy.